Casa Della Fiori is beautifully furnished & decorated in a tasteful, contemporary style, ambient & relaxing, a wonderfully calm atmosphere pervades throughout the rooms. Comfortable and stylish: well equipped with wooden shutters, room fans, terracotta floors & high ceilings to keep you cool. Mosquito screens are fitted throughout. During the winter, the underfloor heating & open fire are a boon. The pretty, marble-topped kitchen is fully equipped. The large dining room has French doors on both sides leading to back and front terraces. The sitting room is seriously comfortable. Outside, the fully tiled loggia provides an outside eating area with views of the village above & rolling fields that surround the house. There is plenty of stylish, comfortable rattan furniture to enjoy those sundowners. Plus elegant wrought-iron tables & chairs under the shady loggia & dotted around the large, lawned garden. The 10 x 5m Pool has Roman steps & a stunning vista. The house has WiFi. My wife and I have always loved Italy and we adore Le Marche. It really is the epitome of Italy: breath-taking beauty in Nature and Art; fantastic food and wine; charming, warm people; wonderful weather: long,long summers, delightful springs and autumns and hard, cold winters. We still travel all over Italy but always yearn for Le Marche: shopping at Tod’s and Prada factory shops, gazing at the turquoise Adriatic over a plate of Portonovo mussels; soaking in Macerata Opera beneath shooting stars; trekking in the majestic Sibillinis with the dogs; chilling with a gelato in a cobble stone piazza. Having a house here is like being in on a really cool secret, a secret we love to share. The owner fell in love with Casa della Fiori’s wonderful position. This beautifully restored farmhouse is at the end of a private lane, below a pretty village, surrounded by fields and less than 15 mins from the turquoise Adriatic coast. It’s a real treat to be able to walk up to village of Piagge with its markets, bars, restaurant, bakers- perfect for picking up the breakfast pastries(and a sublime cappuccino) in under a quarter of an hour. It’s a perfect house for a family or up to 3 couples to spread out in comfort inside and out. It’s a very cool place to chill out and take in the seductive Italian landscape. The award winning beaches of the Adriatic are less than 15 mins away. Here, there are some of the best seafood restaurants in the country as well as cool, chic bars and humble old beach shacks. The annual Rossini Opera Season is held in nearby Pesaro and Urbino-the birthplace of the Renaissance- is close by as are the phenomenal Frassasi caves (the largest in Europe). Pretty, spacious, painted, marble topped farmhouse style kitchen with recently bought equipment: gas hob, electric oven, dishwasher, fridge, freezer, kettle, toaster, cafeteria & microwave. Large, stylish double-aspect dining room which opens out onto two panoramic terraces. Smart but perfect for informal eating inside. The loggia leads from the sitting room and is wonderfully shaded and panoramic:-a fantastic comfortable place for everyone to get together, shoot the breeze, read, chill and enjoy long, long lunches. There are terraces on three side of the house so you can follow the sun(or the shade) throughout the day. .Within sight of the loggia is the fantastic azure 10 x 5m pool. It has Roman steps which are great for encouraging littler ones in the water. Washing machine, iron and board. Leads into Cloakroom Cleaning / Towels / Linen / Maid service: Quality bed linen, towels and pool towels are supplied. There is a weekly maid service. 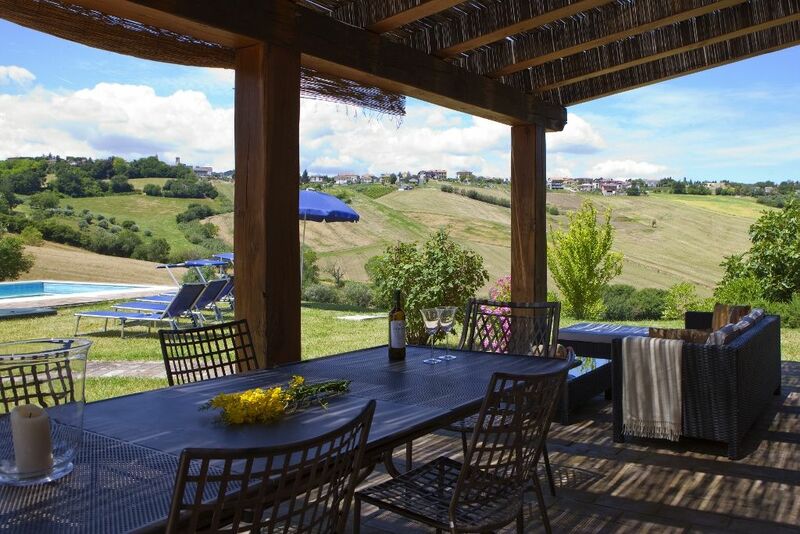 Cannot fault this elegant villa with it's beautiful location: walking distance to a charming village and a short drive to the fantastic Adriatic beaches. Lovely, big pool and gardens. Happy kids and romantic sundowners. Great Holiday in a perfect villa. What a beautiful, comfortable, well maintained villa (with charming and helpful staff). We were hoping for a private, secluded farmhouse close enough to a village to walk up for pastries from the baker and coffee on the piazza and we got this and more. Really close to the coast and beaches ( we booked Silvia to babysit a couple of times and had some fantastic nights at the cool bars, restaurants and clubs only 15 mins away). The kids loved the big pool and garden(and wifi) and are addicted to gelato now.Can't wait to come back! The fantastic, award winning beaches of Northern Le Marche are a mere 15 min drive from Casa Fiori. So if you want a day on the beach, a night on the town, or some of the best fish (and non fish) restaurants in the whole of Italy-ask the Michelin Guide- the coast is only a short drive away. Casa Fiori is less than 20 mins by foot to the charming local village. It's got a pizzeria, restaurant, bars, minimart, bakers, ATM & markets. perfect for if you want to wander up to pick up some freshly baked pastries for breakfast. Urbino- the Birthplace of the Renaissance is about 25 mins away.